I love amoebas. They hang around in mucky water and do all sorts of tidying up activities. They can also hang out in your gut, and that’s extremely unpleasant, but left to their own devices, they are interesting little creatures, moving around their environment, one pseudopod at a time. They grow and reproduce. They have a contractile vacuole, something I’m sure I have in the back of my head, where it squirts out unpleasant things to maintain mood equilibrium. They use them to manage salt. They are filled with ectoplasm. Goo. So are we. Messy stuff, ectoplasm. 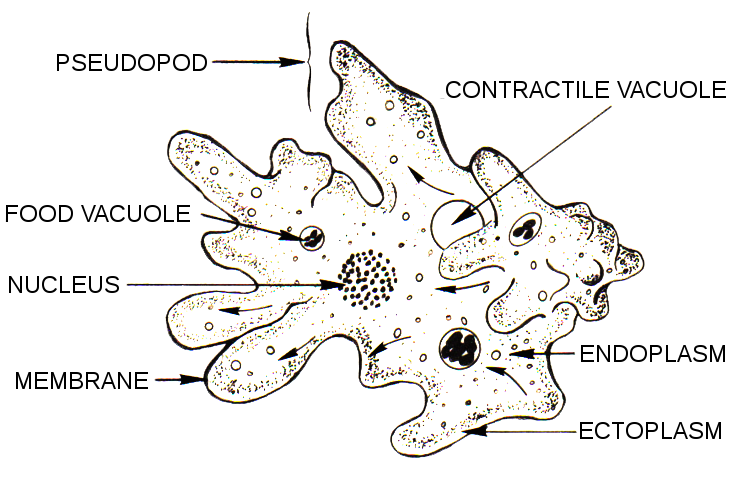 The amoeba is remarkable for its very large genome. The species Amoeba proteus has 290 billion base pairs in its genome, while the related Polychaos dubium (formerly known as Amoeba dubia) has 670 billion base pairs. The human genome is small by contrast, with its count of 2.9 billion base pairs. Unicellular budding yeast has an estimated 12 million pairs. For unicellular organisms, they are so wonderfully complex. Why? I suppose the better question is “why not?” They’ve been around for so long. They probably picked up a bit here, a bit there, embroidered on their genomic life. But it’s one of those things that makes me go, “ooh!”. And wonder. Is more necessarily better? Or are they like Swiss Army animals, able to pull up a genomic shift as needed for survival at a moments’ notice? They also can curl themselves up and hide, waiting for the right environment to grow. Can’t we all? So why am I thinking about amoebas? Well, I feel like one these days. I seem to be growing and going off in several directions, I have no assigned body shape (dieting and exercise are changing my exterior), I wield my contractile vacuole mightily to keep my brain and heart free of entanglements, and yet my inner life is increasingly complex. I’m reaching out to new experiences and pulling them in to me, savouring them. And though other bits of my life are dying off, I jettison them cheerfully and heal around the wound. I find that as I get older, perhaps wiser, I’m getting better at determining what goes into the ejector vacuole. I’m adapting to my environment, I guess. Sometimes, though, I jettison something prematurely…and am oh so grateful when I can send out a wee pseudopod to make contact, and find the contact welcomed.